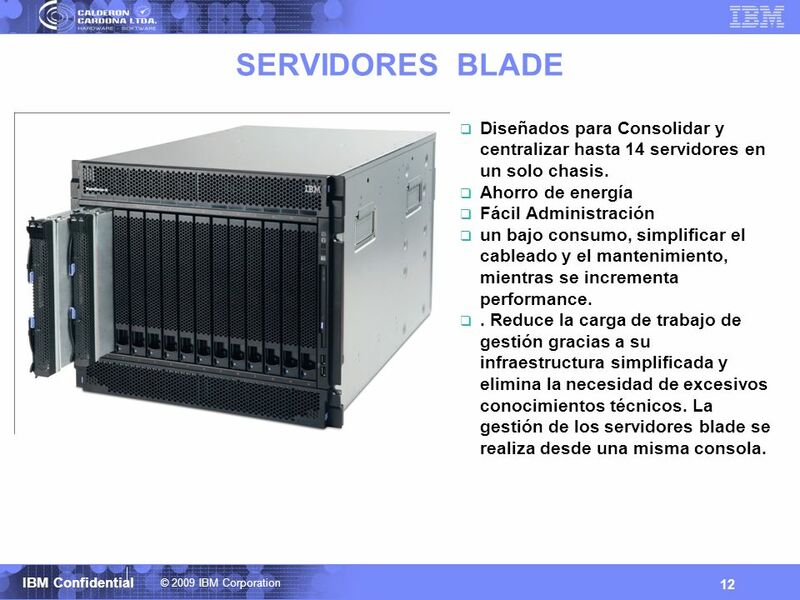 12 SERVIDORES BLADE Diseñados para Consolidar y centralizar hasta 14 servidores en un solo chasis. Ahorro de energía Fácil Administración un bajo consumo, simplificar el cableado y el mantenimiento, mientras se incrementa performance. . Reduce la carga de trabajo de gestión gracias a su infraestructura simplificada y elimina la necesidad de excesivos conocimientos técnicos. 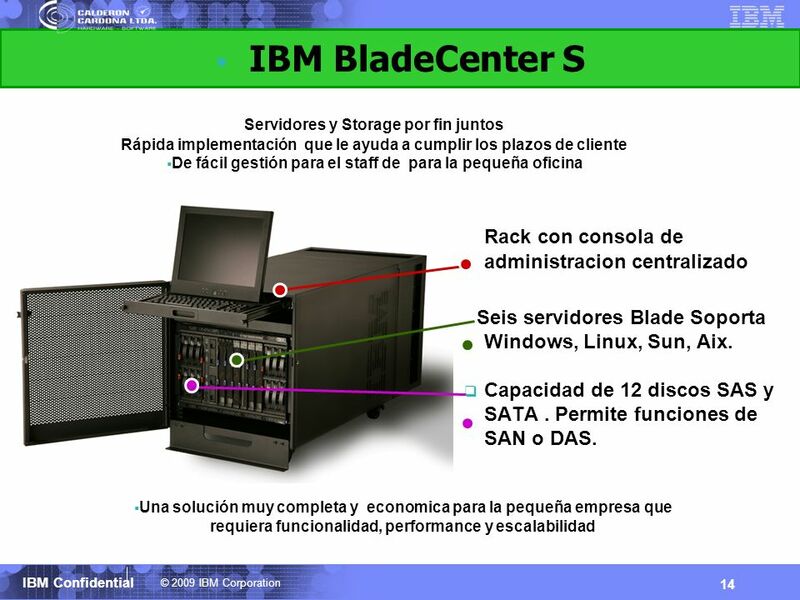 La gestión de los servidores blade se realiza desde una misma consola. 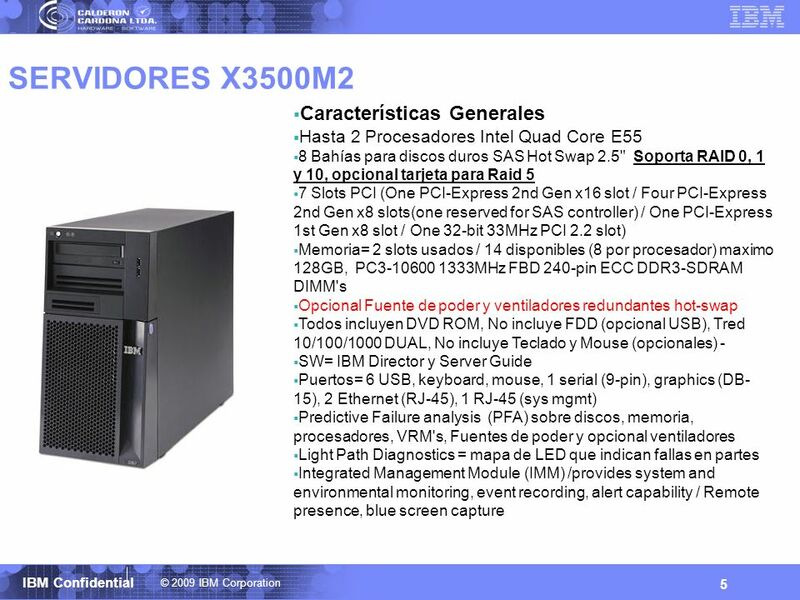 HS12 HS22 HS22v LS22/42 JS23 HX5 Entry and SMB Server General Purpose Enterprise Server Targeted Enterprise Server High Performance Blade Server SMB Server Scalable Enterprise Performance Blade Server INTEL Uni socket Xeon Un solo procesador 2 discos Hot SwapSAS/SATA Slot de memoria 6 (pares) Crece hasta 24GB RAM Crece en discos SAS hasta 600GB Crece en discos SATA hasta 1TB 2 socket Xeon Crece a 2 `Procesadores 12 Slot de memoria / crece a 96GB RAM. 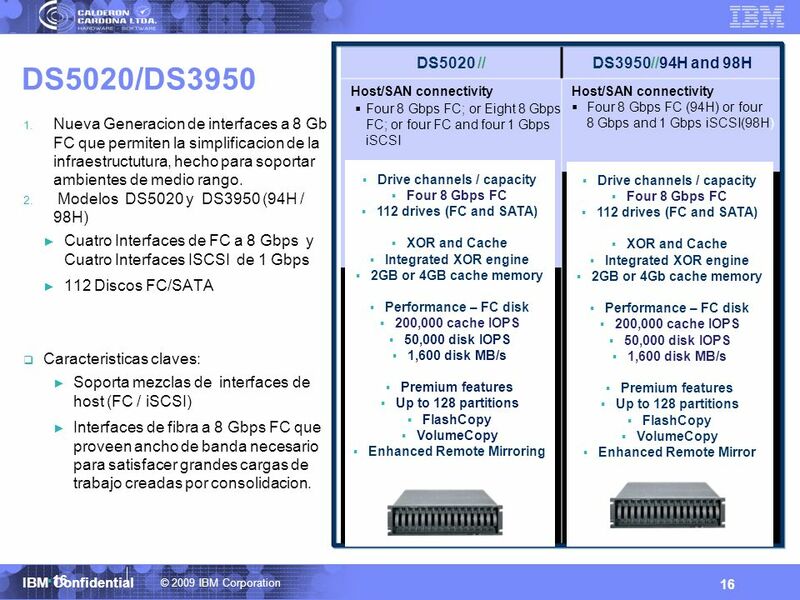 2 Bahias de discos,HotSwap SAS/SATA y NLSAS y NL SATA Crecimiento en discos SAS 600GB Crecimiento en discos SATA 1TB Compatibilidad con chasis H, E y S, HT, T Soporta virtualizacion 2 socket Xeon Dos procesadores, Qud Core y Six Core 55/56 Dos Discos de estado solido unicamente de 50GB Crecimiento de memoria hasta 144GB 2/4 socket AMD Dos o Cuatro procesadores Quad Core y Six Core. 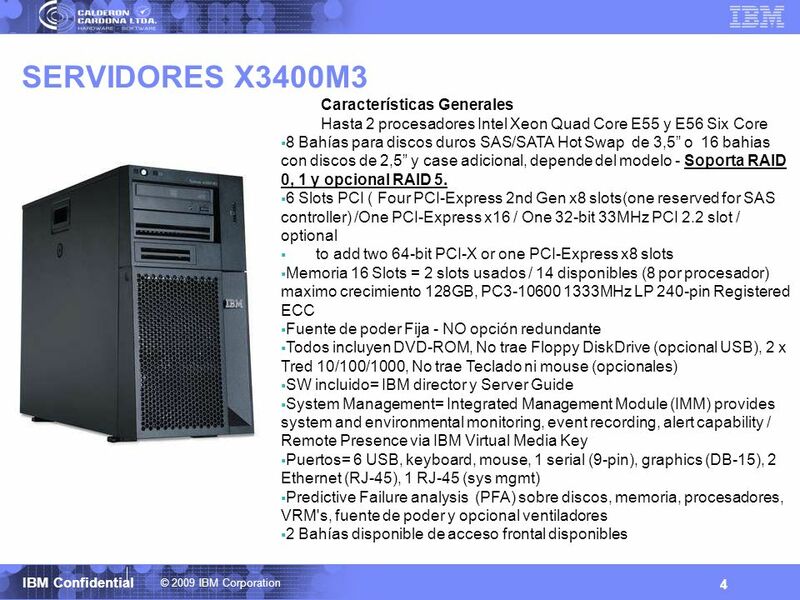 Memoria hasta 64GB o 128GB Dos discos SAS/SATA /Estado Solido Cuatro procesadores Power6 Hasta 64 GB RAM 1 Solo disco Applications AIX, IBM I and Linux Virtualization Value Proposition Value and performance Hasta 4 procesadores Intel Quad, Six o Eight Core. 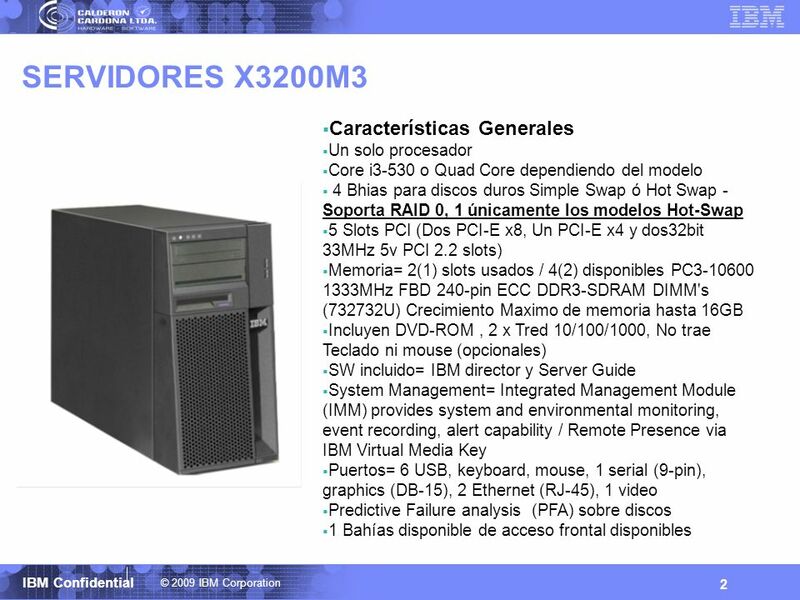 Memoria hasta 128GB o 256GB x 2 socket. Discos 2 X50GB O 4 X50GB de Estado Solido unicamente. 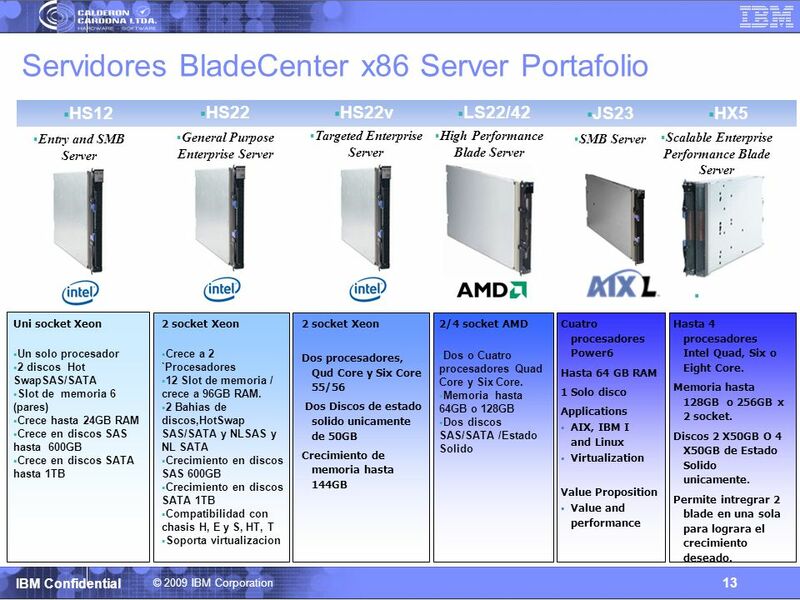 Permite intregrar 2 blade en una sola para lograra el crecimiento deseado. 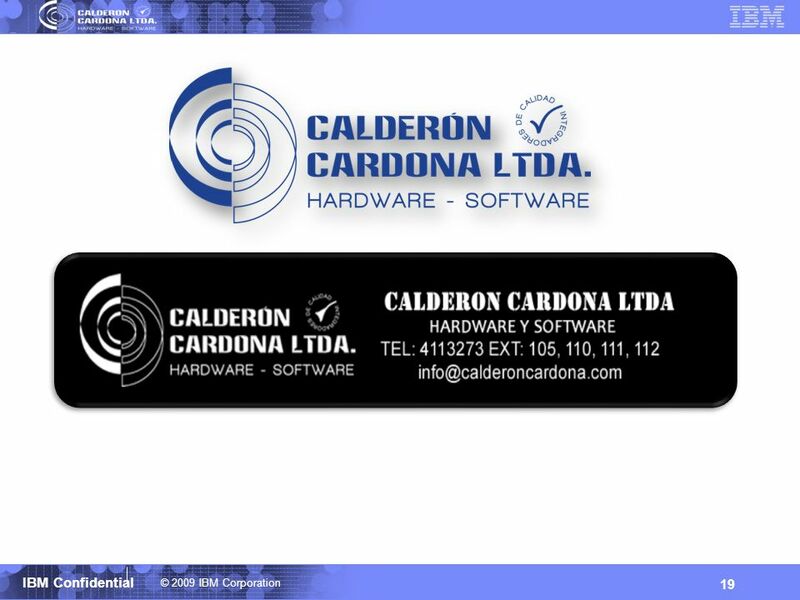 Controladoras duales activas y Hot_Swap(simplex models available) Cuatro puertos SAS a 6 Gb con opcion de adicion de tarjetas: Cuatro puertos SAS a 6 Gbps Ocho Puertos FC a 8 Gbps Ocho puertos iSCSI a 1 Gbps. 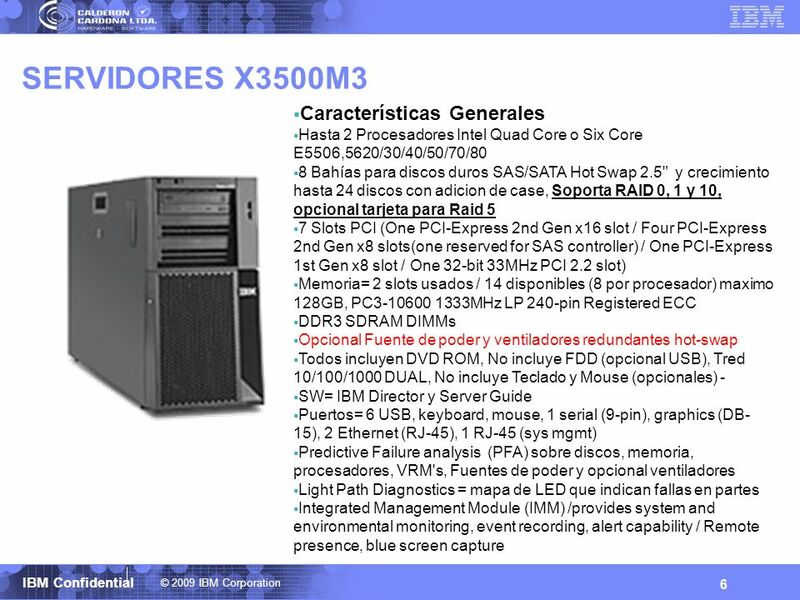 Dos Drive Ports SAS a 6Gb soportando hasta 96 discos SAS Alto desempeño con discos SAS, NL SAS, y FDE Cajas de expasion EXP3512 (2U 12 discos de 3.5-in) y EXP3524 (2U 24 discos 2.5-in) Dedicated data cache is mirrored, battery-back with persistent cache backup 1GB cache standard; 2GB cache disponible como upgrade Base and turbo performance options Turbo alcanza 30% mas de IOPS; y 100% mas en MB/s Dos puertos Ethernet por controladora Uno para manejo remoto y otro para personal de servicio autorizados And let’s get into the specification for the DS3500. 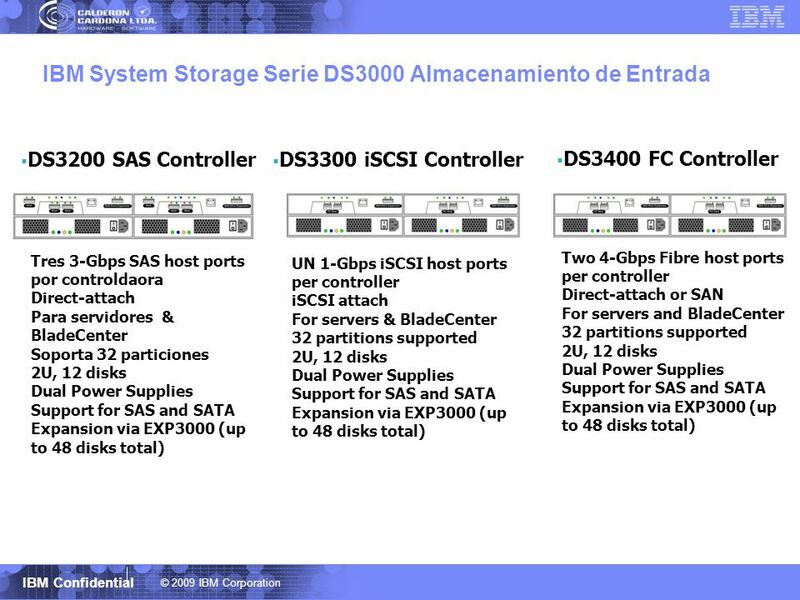 The DS3500 is a dual active controller storage system. Simplex versions are available, but for high availability, dual controllers are recommended. 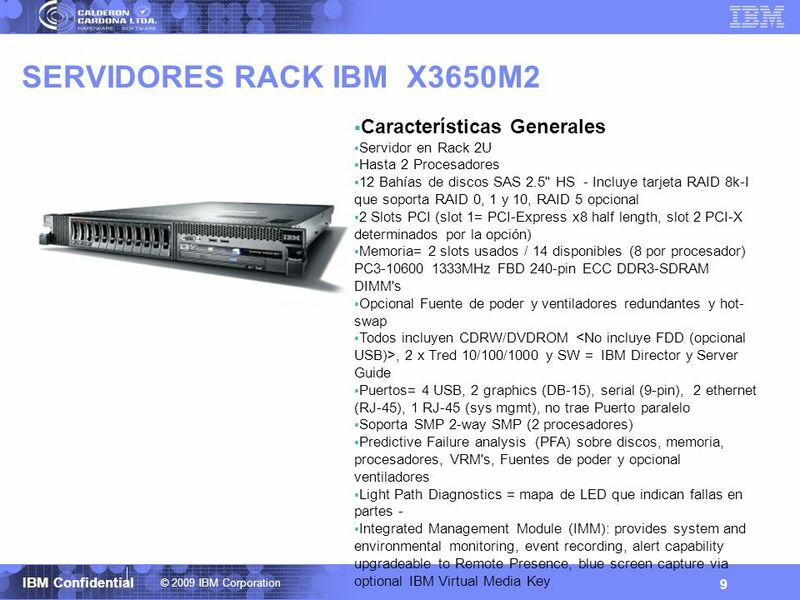 Each controller includes two native SAS host ports per controller for a total of four in a dual controller configuration. With the addition of two daughter cards, one for each controller, you can add a total of four additional SAS host ports, eight 8Gbps FC ports or eight 1 Gbps iSCSI. In addition, with a dual controller configuration, you have two SAS drive ports which support expansion up to 96 SAS drives. SAS drives supported include high performance SAS, nearline SAS, and full disk encryption SAS drives for data that needs to be secured. The DS3500 takes drive support a step further with support for different drive sizes as we mentioned with support for the EXP3512 which is out 2U twelve 3.5-in drive expansion unit and the EXP3524 a 2U expansion unit that supports up to twenty-four 2.5-in drives. 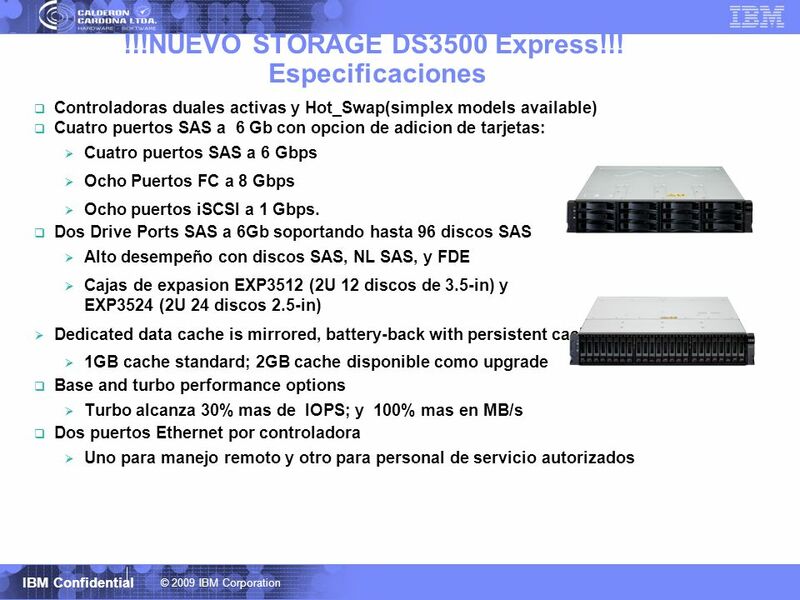 The DS3500 also includes 1 GB of cache standard with an option to upgrade to 2Gb of cache. And this is per controller so with a dual controller configuration, you can upgrade up to 4GB of cache. With dual controller, the cache is mirrored. Cache is also destaged to a flash drive. This is key for extended power outages. When the power goes out, data in cache is automatically written to a flash drive. When power returns, that data is written back to cache within a couple seconds…your data in cache is always safe. 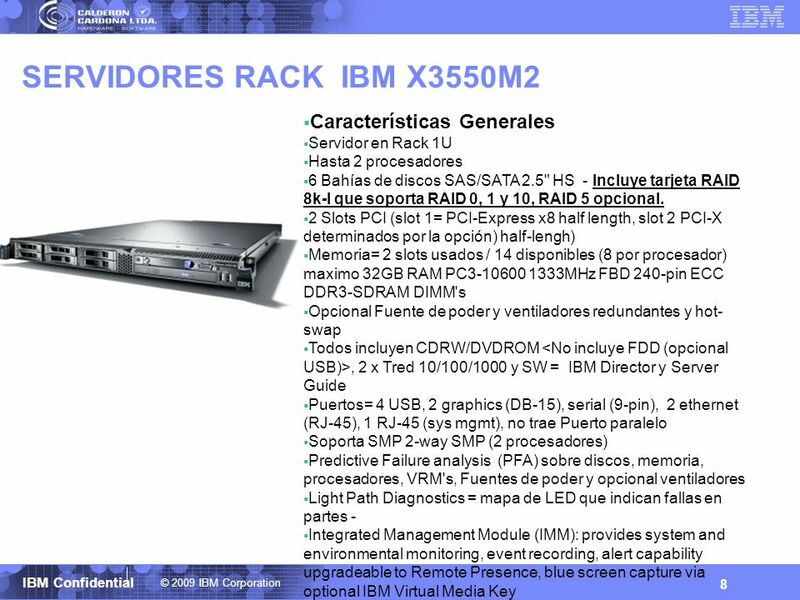 Newly introduced to the SAS-based storage systems is a base and enhanced performance, or turbo option. The enhanced turbo option is especially good for bandwidth intensive applications, with 100% MB/s improvement over base performance, such as video streaming as well as consolidation and virtualization projects. The DS3500 controller also includes two Ethernet ports. One for remote, or out-of-band, management and an additional port for support personnel to trouble shoot and diagnose any technical issues. 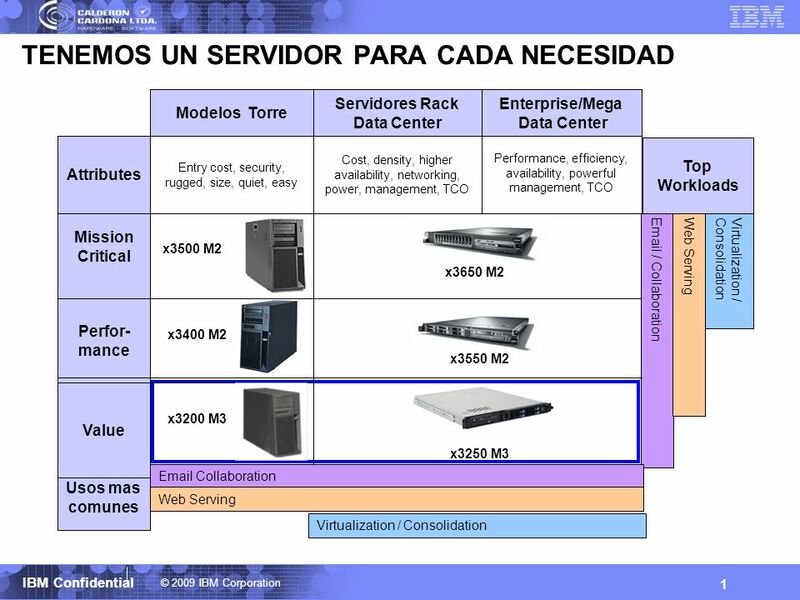 Descargar ppt "TENEMOS UN SERVIDOR PARA CADA NECESIDAD"
10:00 INTRODUCCIÓN (Microsoft, HP, Intel) 10:15 Windows Server para entornos Web DEMO: Escalabilidad con HP blades y Windows Server 2003 Internet Information. 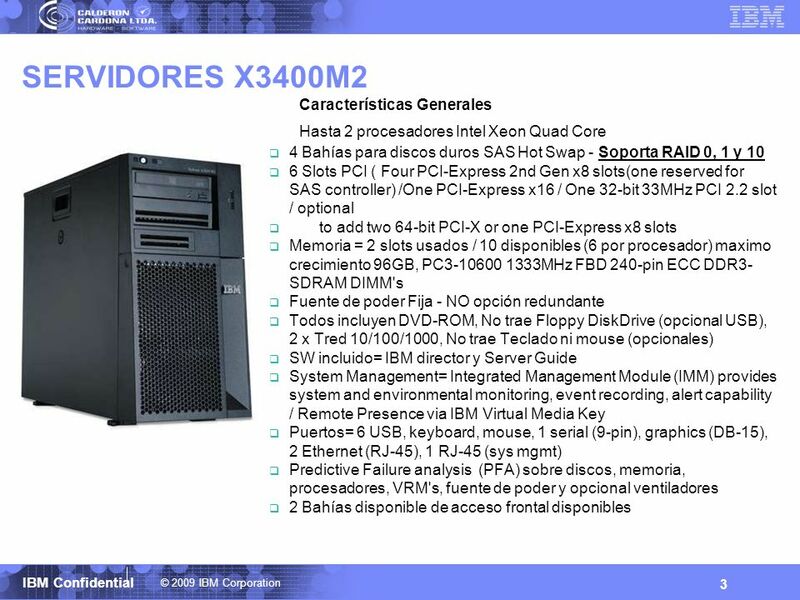 LAS MEMORIAS DEL COMPUTADOR CURSO: COMPUTACION ALUMNO: SANCHEZ SANCHEZ, Toribio. 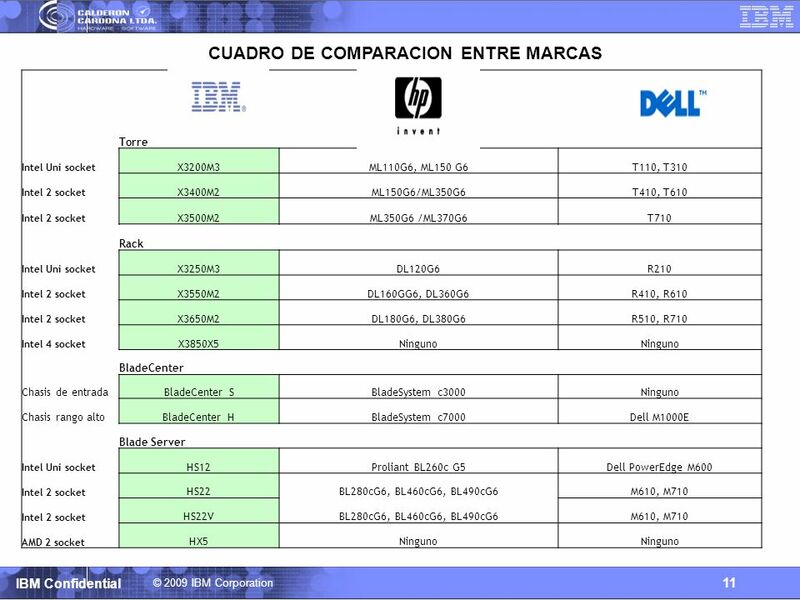 Subnetting Class B Addresses and Troubleshooting IP Addressing COMP 417.
n o cc m JJ A H DD BATERÍA ff USB II CONECTOR DEL VENTILADOR V CONECTOR PRINCIPAL DE ALIMENTACIÓN L CONECTOR PRINCIPAL DE VOLTAJE.